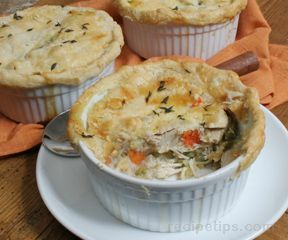 Tender chicken, fresh vegetables, and a savory sauce baked in a flaky pastry crust – one of those perfect comfort foods. Place the flour and salt into a food processor. Add the chilled butter and pulse 5-6 times. Add the chilled shortening and pule 3-4 more times or until the dough resembles cornmeal. Stream in the water one tablespoon at a time and pulse after each addition. The dough is ready when in sticks together when you press it with your hands. Place the dough on a clean, dry surface and mold it into a ball. Then flatten it out into a disk. Sprinkle both sides of the disk with flour and wrap it in plastic wrap. Place in the refrigerator for at least one hour but can be kept for as long as two days before rolling it out. To the skillet add the onion, carrots, celery, mixed vegetables, mushrooms and garlic. Add the thyme, poultry seasoning and parsley. Stir in the flour and cook for one minute while stirring. Whisk in the chicken stock or broth and the milk until combined. Cube the leftover chicken into bite sized pieces or if you are using a rotisserie chicken, remove the meat from the bones and cube the meat into bite sized pieces. Fill 6 ramekins with the filling. Allow to cool completely before putting on the crust. This filling can be prepared a day ahead, cooled and covered in the refrigerator. When ready to use the dough, roll out the dough onto a lightly floured working surface until it is approximately 1/8-1/4 inch thick. Lay a ramekin onto the surface of the dough and cut out six circles that are a little larger than the circumference of the ramekin. Place the dough on top of each filled ramekin. Fold the dough over the edge of the ramekin and using the tynes of a fork, press down into the dough all the way around to help seal the dough. Whisk together one egg and 1 tablespoon of water and brush the egg wash onto the crust of each pot pie. Cut a vent hole into each crust. Place the ramekins onto a baking sheet and then place the baking sheet into the oven. Bake for 30 minutes or until the crust is golden brown and the filling is heated through. "Great chicken pot pie. We all loved it. I took the easy way out though and bought a rotisserie chicken and refrigerated pie crust for the top."